Jesus asked Blind Bartimaeus a pointed question: “What do you want me to do for you?” That got a direct faith response. Jesus was and is The Truth — and Truth is straightforward. Matthew and Luke took Mark’s quite brief little gospel and copied it pretty much word for word, with their unique additions tacked on to it in order to reach their distinctive communities of Christian readers (Luke was a Gentile, but Matthew was a Jew and his gospel is very Jewish-oriented, and John’s gospel is a whole other loaf of communion bread). Most of us in our confused, helter-skelter society have so many wants, we don’t know what we want. But it’s not because of a shortage of others telling us what we want or what we need to do — politicians and media pundits (ever notice that most of them can’t run their own lives but presume to know what we need or want???) and advertisers and, closer to home, our own friends and relatives can be plenty willing to tell us what we need or need to do, which may very well be their own needs. What do you really, really want in your life? 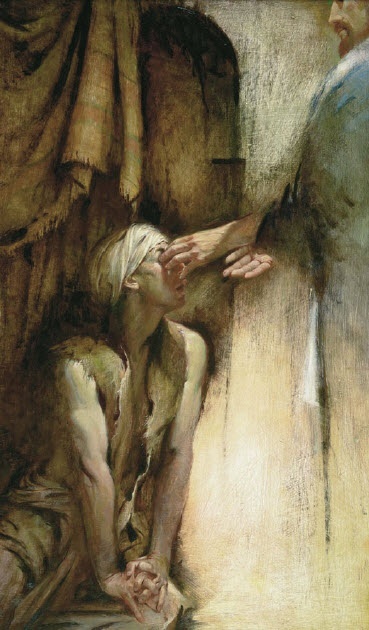 “Many sternly ordered him to be quiet, but he cried out even more loudly, ‘Son of David, have mercy on me!’ Jesus stood still and said, ‘Call him here.’ And they called the blind man, saying to him, ‘Take heart; get up, he is calling you.’ So throwing off his cloak, he sprang up and came to Jesus.